Atlas Model Railroad Company make scale models in N, HO and O scale, as well as a collection of accessories. Based out of New Jersey in the United States, they’ve been in business since 1924, so you know they’ve been doing something right! In the early years, all they did was make rail, track and switches for them, before importing O scale trains in the early 70’s. Now, they make their own, and in a variety of different sizes. To this day, they’re still a family owned and operated business! Atlas are famous for their exceptional flexitrack and rail lines in codes 55, 80 and 100, so if you’re looking for some extra pieces to expand your line, start here! All of their products come in 3 variations – Master, Classic and Trainmaster. Each one varies in price and quality, so there’s something for everyone. Athearn Trains are a post-war company established in 1946. They specialize in HO and N scale locomotives and accessories for the hobby enthusiast. They became so good at producing HO scale trains, that when Lionel Trains (the biggest manufacturer in the world now) wanted to get into it, Athearn made HO model locomotives for them! Athearn runs a set of HO trains in two categories, Ready-to-Run and Genesis. Genesis is their top of the line HO train sets, so if you’re a serious collector, you can’t go wrong with these! Because they specialize in HO trains, they make more than 100 different types of locomotives in that scale, so you’ll always be able to find something you need. Walthers is a model train company started in 1932. Within 5 years of their founding, their product catalogue went from 5 pages to 80, based solely on customer demand. These days, they’re one of the largest HO scale locomotive manufacturers in the world. They’re considered the main manufacturer of passenger cars in that scale worldwide. These days, their product line numbers in the tens of thousands. They manufacture everything now from G scale trains through to N scale locomotives, buildings, cars, accessories, DCC packs, and modelling tools and finishes. They’re really your one-stop shop as a beginner to get everything you need to start off with. 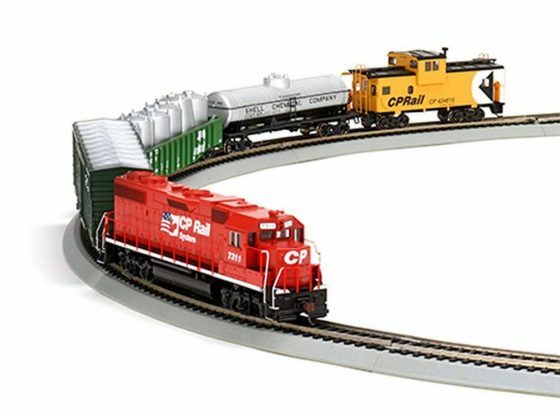 Bachmann Trains are another brand of model train makers that are grandfathered into the industry. They got their start more than 180 years ago, in 1833! Although technically they didn’t get into train making until 1966, with the sudden burst of popularity in N scale trains. They currently turn over more than $100 million dollars a year in revenue and are continuing to grow. Bachmann currently makes trains in every popular scale, as well as a few niche markets. On top of that, they also create other scale models, including planes and cars, so if you’re looking for something special to add to your layout, this might be the brand for you. Kato Precision Railroad Models are a Japanese manufacturer of N and HO scale trains. Founded in 1958, they tend to specialize in N scale productions of both American trains as well as Japanese locomotives like bullet trains. They’ve also made a move into manufacturing high-speed European locomotives as well. They’re perfect if you’re looking to get into something a little different and don’t want the same thing as every other person. Intermountain Railway Company is a small manufacturer located in Colorado, USA. They predominantly make locomotives and freight cars in HO, N and Z scale. They’re one of the better Z scale brands on the market, so they’re worth looking into for a small layout. All of their prices are incredibly reasonable, so they’re a great beginner brand! The Lionel Corporation was originally founded in 1900 as a toy and novelties company. Their claim to fame was their immaculately designed trains, and soon that’s all they focussed on. They were one of the biggest manufacturers in the world for model trains throughout the 50’s and 60’s although these days they’re “technically” out of business. Why technically? Well, they went into liquidation in 1995, and have shut down all their stores, however, they restructured as Lionel LLC, and continue to make new models and railroad kits. In 2007, it was announced they made 60% of all O scale trains on the market. They’re a bit of a legacy brand and make locomotives so they can be a bit pricey, however, you definitely get what you pay for. So if you want an attention-grabbing showstopper, look into Lionel Trains. Bowser Manufacturing was founded in 1946 and produce primarily HO scale trains although they also make N and O scale trains. They had a bit of a tumultuous history, with Bill Bowser, the founder, eventually being forced out of the company. Bowser, under Bill, was the first company to make a truly accurate scale representation of a train in HO scale, as other brands were doing it “as close as possible”. This was such a big deal, that Bill was eventually inducted into the Model Railroading Industry Association Hall of Fame in the early 2000’s. They produce amazingly detailed trains that run quietly and smoothly and are a great choice no matter what level of enthusiast you are. Check out our post here to learn more about other scales of model trains and everything else you need to know!